ARUA – President Yoweri Museveni Monday morning travelled to Arua to attend the burial of slain Arua Municipality and NRM legislator Col. Ibrahim Abiriga, who was shot dead last Friday at Kawanda, near Kampala. Don Wanyama, the presidential press secretary confirmed that President Museveni is in Arua. Pundits feared that following the violence that ensued on Sunday, the President would cancel plans to travel. 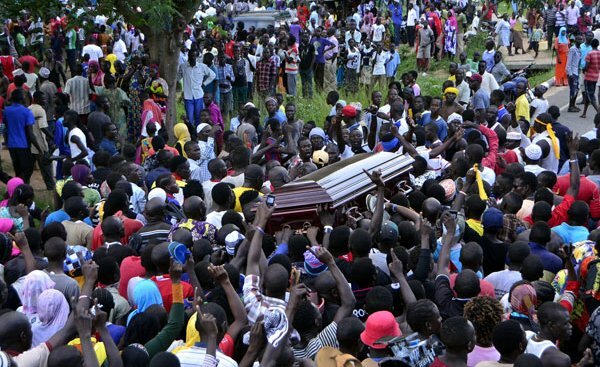 PML Daily has learnt that security has been tightened ahead of the burial in Arua town. On Sunday, angry youth tried to attack Arua’s main police station blaming government over the legislator’s death. Youth successfully hijacked the bodies of the fallen MP and his brother and bodyguard Saidi Kongo from the funeral service provider, A-Plus, while chanting “we don’t want yellow”, but later the situation calmed after police fired teargas and bullets to disperse the rioters. A vehicle belonging to A-PLUS and local NGO, as well as police motorcycles were destroyed as angry residents moved to grab the bodies forcing family to seek refugee at the police station. Equipment belonging to journalists including cameras and audio recorders were destroyed as scribes scampered for saftey. To avoid further disarrays the body was shifted from his home to Rhino camp in Likudu village, his ancestral home. Members of Parliament and residents have gathered at Rhino camp in Likudu village to pay their last respects to the celebrated Arua municipality MP and his late brother.